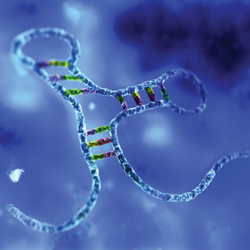 Researchers from Harvard have found correlations between certain microRNA molecules — small RNA molecules present in every cell of the body — and indicators of disease severity in patients with MS, suggesting that these microRNAs could be biomarkers for the condition. "Our results are exciting in that they suggest microRNAs have promise in identifying underlying pathogenic processes in MS," senior author, Rohit Bakshi, MD, Department of Neurology, Brigham and Women's Hospital, Harvard Medical School, Boston, Massachusetts, commented to Medscape Medical News. "Ultimately we would like to envision that by analyzing a patient's microRNA profile we could have a good idea of what type of MS they had, their prognosis and the best therapy to use." Their findings are described in a paper published online in JAMA Neurology on January 23. In an accompanying editorial, Darin T. Okuda, MD, Southwestern Medical Center, Dallas, says, "Having access to an accurate, easily acquired, and inexpensive biomarker would be of great value when counseling patients on the anticipated temporal profile of the disease course and risk for central nervous system injury. "Currently, MS is highly heterogeneous both clinically and radiologically and varied responses to treatment are frequently identified," he adds. "The hope is that future efforts may allow for better disease state delineation before appreciating significant central nervous system injury based on the presence of distinct biomarker signatures." Coauthor of the paper, Roopali Gandhi, PhD, Harvard Medical School, Boston, explained to Medscape Medical News that microRNAs control gene translation and expression in all cells. "There are thousands of different microRNAs and it has been hypothesized that certain ones may be associated with specific diseases," Dr Gandhi said. "There is a lot of work going on now trying to identify all the different microRNAs and look for associations with various medical conditions." The goal of the current study was to identify any microRNAs that were associated with MS activity, as defined by active lesions on MRI. The researchers took serum from 120 patients with MS from two different cohorts who also had MRI data and tested samples in a platform to measure 600 different microRNA molecules. "We looked for any correlation of specific microRNAs with signs of MS disease activity, including T2 lesions, severity of the lesions (ratio of T1 to T2), and atrophy of the brain and spinal cord," Dr Bakshi explained. "We found several different microRNAs which seemed to be associated with different aspects of MS," he added. "Other observations were that different sets of microRNA signatures were associated with disease activity in the brain vs the spinal cord; different microRNAs were associated with T2 lesions than with brain or spinal cord atrophy; and some microRNAs appeared to be a signal of harm (associated with aggressive disease) whereas others were associated with a protective profile — a more benign disease course." They found four microRNAs that appeared to have a protective correlation and two microRNAs that showed a pathogenic relationship with brain MRI lesions. Two other microRNAs were associated with a greater degree of brain atrophy. The study also showed protective associations between seven different microRNAs and clinical disability measures after adjustment for multiple comparisons in one cohort. But this observation was not reproduced successfully within the other cohort. "Because reducing the probability of acquired disability is the main goal in the management of MS patients, it would seem that these miRNAs would be more relevant and most promising for future related efforts," Dr Okuda says in his editorial. Dr Bakshi warned that all their findings needed to be confirmed in a larger study. "We looked at 600 correlations, and the associations we saw did not remain significant after we adjusted for multiple statistical tests so we have to be somewhat cautious about our results." In addition, the current study was cross-sectional study in design, focusing on observations at one time point. The researchers are now planning to move forward with longitudinal studies to see whether certain microRNAs can predict future disease activity and disability. Dr Gandhi pointed out that unlike many other potential MS markers, these microRNAs have several desirable qualities, including being very stable. "They are easy to collect and store and easy to translate into a clinical setting." Dr Okuda notes some particular strengths of the study, including the group of investigators, who are well known for their prior contributions to the field of MS and neuroimaging. "These data also represent a novel approach to assessing disease by incorporating serologic biomarkers coupled with radiologic features; however, interpretative limitations apply given the lack of any significant results when correlated with MRI outcomes after statistical adjustment," he adds. Dr Okuda say that several questions still exist related to causation and the effect of other factors, including prior therapeutic exposure, circadian influences within chronic disease states, and the temporal evolution of the concentrations of the microRNAs within individuals.